Research in our lab is aimed at understanding the regulation of signal transduction in mammalian cells. We are currently focusing on two specific pathways; the role of cytochrome c in the regulation of apoptosis, and redox regulation of mammalian cell signalling. In collaboration with Professor Ian Morison we have identified the first naturally occurring mutation in cytochrome c, in a New Zealand family with mild thrombocytopenia (low platelets). This mutation enhances the activity of cytochrome c in the cell death pathway. By dysregulating platelet production in the bone marrow, the mutant protein causes premature release of platelets into the marrow space instead of into the circulation. We are characterising the molecular basis of this increased activity, and determining how this alters platelet production. 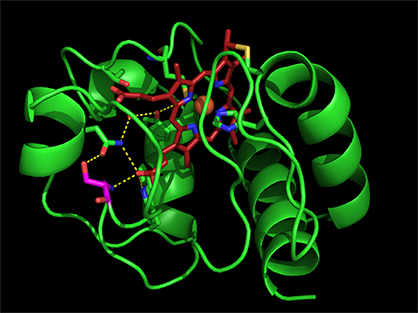 Crystal structure of human G41S cytochrome c.
Oxidants and free radicals have historically been considered harmful, causing damage to cells and being associated with disease. However over recent years it has become apparent that reactive oxygen species and shifts in redox equilibria can have beneficial as well as detrimental effects in cells. We are interested in understanding how alterations in redox equilibria translate into cellular outcomes. Hydrogen peroxide is a particularly important oxidant in cell signalling, and our data suggests that the peroxiredoxin family of peroxidases has an active role in converting peroxides into useful signals in mammalian cells, by catalysing disulfide bond formation in target proteins. 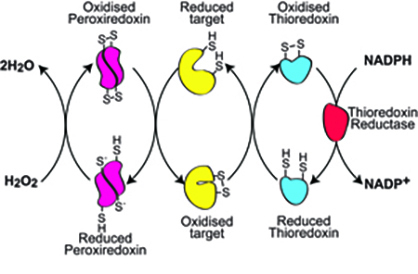 The function and regulation of peroxiredoxins, and other antioxidant enzymes, is being investigated using inducible overexpression and knockdown of enzymes involved in the metabolism of reactive oxygen species (ROS) and analysing specific signalling pathways. Model for the function of peroxiredoxins. Ledgerwood, E. C., & Prins, J. B. (1999). Tumour necrosis factor alpha. In S. M. Marshall, P. D. Home & R. A. Rizza (Eds. ), The Diabetes Annual. (12 ed.) (pp. 161-180). Amsterdam: Elsevier. Ledgerwood, E. C., & Brennan, S. (1995). Furin. In A. Haeberli (Ed. ), Human Protein Data: 3rd Instalment. VCH: Weinheim and New York. Jarvis, R. M., Göttert, J., Murphy, M. P., & Ledgerwood, E. C. (2007). Mitochondria-targeted antioxidants do not prevent tumour necrosis factor-induced necrosis of L929 cells. Free Radical Research, 41(9), 1041-1046. Hughes, G., Murphy, M. P., & Ledgerwood, E. C. (2005). Mitochondrial reactive oxygen species regulate the temporal activation of nuclear factor κB to modulate tumour necrosis factor-induced apoptosis: Evidence from mitochondria-targeted antioxidants. Biochemical Journal, 389, 83-89. Smith, R. A. J., Kelso, G. F., Blaikie, F. H., Porteous, C. M., Ledgerwood, E. C., Hughes, G., … Filipovska, A., & Murphy, M. P. (2003). Using mitochondria-targeted molecules to study mitochondrial radical production and its consequences. Biochemical Society Transactions, 31, 1295-1299. Kelso, G. F., Porteous, C. M., Hughes, G., Ledgerwood, E. C., Gane, A. M., Smith, R. A. J., & Murphy, M. P. (2002). Prevention of Mitochondrial Oxidative Damage Using Targeted Antioxidants. Annals of the New York Academy of Sciences, 959, 263-274. Kelso, G. F., Porteous, C. M., Coulter, C. V., Hughes, G., Porteous, W. K., Ledgerwood, E. C., Smith, R. A. J., & Murphy, M. P. (2001). Selective targeting of a redox-active ubiquinone to mitochondria within cells: Antioxidant and antiapopotic properties. Journal of Biological Chemistry, 276(7), 4588-4596. Scarlett, J. L., Sheard, P. W., Hughes, G., Ledgerwood, E. C., Ku, H.-H., & Murphy, M. P. (2000). Changes in mitochondrial membrane potential during staurosporine-induced apoptosis in Jurkat cells. FEBS Letters, 475, 267-272. Ledgerwood, E. C., O'Rahilly, S., & Surani, M. A. (2000). The imprinted gene Peg3 is not essential for tumor necrosis factor alpha signaling. Laboratory Investigation, 80, 1509-1511. Ledgerwood, E. C., O'Rahilly, S., & Surani, M. A. (2000). The imprinted gene Peg3 is not essential for tumour necrosis factor alpha signaling. Laboratory Investigation, 80(10), 1509-1511. Ledgerwood, E. C., Pober, J. S., & Bradley, J. R. (1999). Recent advances in the molecular basis of TNF signal transduction. Laboratory Investigation, 79, 1041-1050. Faraco, P. R., Ledgerwood, E. C., Vandenabeele, P., Prins, J. B., & Bradley, J. R. (1999). Tumor necrosis factor induces distinct patterns of caspase activation in WEHI-164 cells associated with apoptosis or necrosis depending on cell cycle stage. Biochemical & Biophysical Research Communications, 261, 385-392. Jones, S. J., Ledgerwood, E. C., Prins, J. B., Galbraith, J., Johnson, D. R., Pober, J. S., & Bradley, J. S. (1999). TNF recruits TRADD to the plasma membrane but not the trans-Golgi network, the principle subcellular location of TNF-R1. Journal of Immunology, 162, 1042-1048. Faraco, P. R., Ledgerwood, E. C., & Smith, K. G. C. (1998). Apoptosis in renal disease. Sepsis, 2, 31-37. Min, W., Bradley, J. R., Savidge, J., Jones, S. J., Ledgerwood, E. C., & Pober, J. S. (1998). The N-terminal domains target TRAF2 to the nucleus and display transcriptional regulatory activity. Journal of Immunology, 161, 319-324. Ledgerwood, E. C., Prins, J. B., Bright, N. A., Johnson, D. R., Wolfreys, K., Pober, J. S., … Bradley, J. R. (1998). Tumor necrosis factor is delivered to mitochondria where a tumor necrosis factor-binding protein is localized. Laboratory Investigation, 78, 1583-1589. Prins, J. B., Ledgerwood, E. C., & et al (1998). Tumor necrosis factor-induced cytotoxicity is not related to rates of mitochondiral morphological abnormalities or authophage - chnages trhat can be mediated by TNFR-I or TNFR-II. Bioscience Reports, 18, 329-340. Ledgerwood, E. C., Brennan, S. O., & George, P. M. (1997). Endoproteases other than furin have a role in hepatic proprotein processing. Biochemistry & Molecular Biology International, 42(6), 1131-1142. Hill, R. M., Ledgerwood, E. C., Brennan, S., Pu, L. P., Loh, Y. P., Christie, D., & Birch, N. P. (1995). Comparison of the molecular forms of the Kex2/subtilisin-like serine proteases SPC2, SPC3, and furin in neuroendocrine secretory vesicles reveals differences in carboxyl-terminus truncation and membrane association. Journal of Neurochemistry, 65, 2318-2326.